This section is special – we usually make a page for each individual stone, mineral, fossil, or shell. However, Abalone and Paua refer to two extremely similar shells – Paua is the Maori word for a different member of the genus which only occurs in the waters of New Zealand. I’m sure some of you have heard of Abalone, and some won’t have heard of Paua. To simplify, they are two members of the same family. Paua is simply the Maori word for the shell – and as such, the term is incredibly prevalent in New Zealand and has spread outwards. Abalones are a type of shellfish found worldwide. 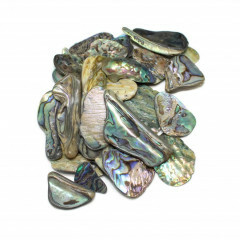 On this site, when we mention Abalone, we are referring purely to the shell. Typically speaking, Abalone has three main uses. My knowledge of these is somewhat biased to the jewellery side, and to usage in New Zealand, as I’ve visited. Abalones are considered a delicacy in a fair few places around the world, including New Zealand, Latin America, Guernsey, and Asia. The Maori culture has used Paua in their decorative woodwork for centuries, and there is a huge tourist trade based around this. It is now used in a wide range of decorative items, set into resin or wood and sold as souvenirs. 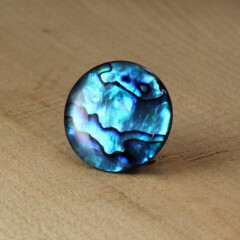 Similar to the decoration aspect, Abalone is also used for jewellery – either natural or dyed. It has a gorgeous mix of colours even before dye treatment. 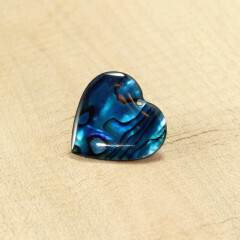 As the shell is quite thin, it is only really suitable for flat beads, or cabochons. It is also used in new age ‘smudging’ ceremonies. More information on this can be found below, in our ‘spirituality’ section. Abalone has been used by Man since antiquity, either as a food source or a decoration. The oldest known find I am aware of is 100,000 years old, from a cave in South Africa. Abalone is found in many ancient cultures around the world due to its abudance as an easy food. Since the 1950s, however, the mixed usage of this animal has led to overfishing – there are several places around the world which have imposed strict limitations on the amount of Abalone that can be removed. Certain members of the genus are now on the endangered list. Most of the Abalone meat eaten worldwide is now from farmed sources. Abalones are found worldwide, particularily the seas off the United States, the Channel Islands, New Zealand, Australia and around South Africa. Ordinarily, this section would give a simplified overview of the chemistry in each particular mineral. Obviously, Abalone is an organic material comprised of ’tiles’ made of Calcium Carbonate, which does make it very strong – although small pieces are still brittle. The inside of the shell consists of iridescent nacre, otherwise known as ‘Mother of Pearl’. Abalone is both fine to eat and to handle. When cut and polished, or rough, it is fine. The danger with this material lies in the actual cutting process itself – Abalone dust is incredibly bad for you when inhaled. To be clear – most organic materials and most rocks and minerals also produce dust which is harmful to humans. As with most lapidary work, the advice is to always work the material wet, to avoid dust propagation as much as possible, and to wear either a forced air respirator or a good quality particulate filter mask. This is gathered from multiple sources across the internet and a wide range of books, before being written out for you. This means you get the information they agreed upon, rather than the bits that may have been added… well, along the way. It is important to note however, that we believe crystals and crystal healing should be used alongside medicine and treatment options, not instead of them. Crystal healing can be a great way to keep a positive mindset during hard times, and your mindset may absolutely make the difference and assist any other medical treatments you are undergoing. While Abalone is not a crystal, many still believe it has healing properties. My personal belief on the matter is that you have to choose and believe in the piece you use – whether it is a crystal or not is not especially relevant. I have a favourite rock – go figure. Typically the recommendation for healing with Abalone is to wear it as jewellery. This keeps it close to you, but more importantly, avoids having to carry pieces of a relatively brittle shell around with you. Jewellery is far less likely to break and is likely the better investment for day to day carrying. We do sell small polished pieces for pocket carrying, though. Most believe the shell has a connection to the water, and its supposed benefits derive from that – it is calming, soothing, and peaceful. If you feel relaxed thinking of the water, this may be the shell for you. The common consensus seems to be that Abalone is connected to the crown, third eye, and heart chakras. Some also think there is a strong connection to the Solar Plexus chakra. Most people believe that due to Abalones deep connection to the sea, and therefore water, the shell is best used by those under the water signs. It would therefore be best used by those under the signs of Cancer, Scorpio and Pisces, as well as Aquarius. Abalone shells are also commonly used in smudging ceremonies to catch falling ash. If you choose to do that, I’d recommend adding a thin layer of sand inside the shell. This will prevent any hot ash from burning the shell, which can, of course, damage it – but also, smells terrible.